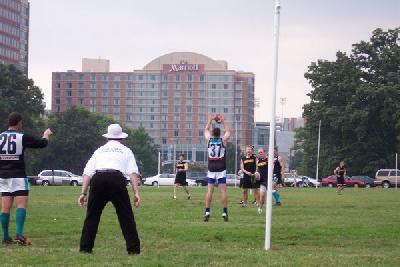 The first ever US Collegiate Championships for Australian Rules football were held in Nashville over the weekend September 10th to 12th 2004. A huge effort was put in to ensure its success, for what will hopefully be the start of a new era for Aussie Rules in the United States. As the first such footy collegiate event, the Championships were something of a learning experience, and late notice withdrawals kept the organisers on their toes. The main purpose of the weekend was to seed future development of the game throughout colleges in the US. Such growth may well be vital for the continued success of footy, as the college system is where most of the elite American athletes are developed. The event was held in conjunction with the Australia Festival and the Nashville Kangaroos, who played the Chicago Swans in a MAAFL match on the Saturday. Ultimately five teams took part in the tournament, although MTSU combined with Belmont to make sufficient numbers. More clubs may have attended had the schedule suited them better, and this will no doubt be considered next year. After a series of three matches each, the Missouri Roos finished top, followed by MTSU Raiders, Vandy Commodores and the Ohio Buckeyes. The semi-finals saw Missouri and the hosts Vandy go through to the final. A good crowd was on hand to see the more experienced Missouri side build a four goal lead before the younger Vanderbilt side, featuring many players in their first season, fight back before the Roos steadied to take a deserved victory, 6.4 (40) to 4.7 (31). The organisers are confident that the tournament has successfully seen Australian Rules football accepted as a legitimate sporting option at Vanderbilt University, and after a committed recruiting campaign, the Nashville Kangaroos have many new recruits from Vandy training with them. With time and effort invested in the new players, Nashville could become an Australian Rules centre for excellence in the United States. 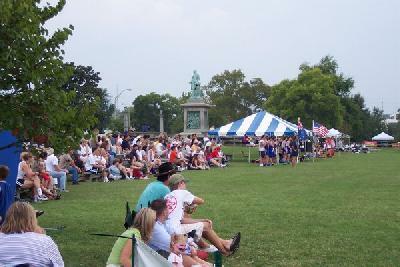 Discussions were also held planning to make the Collegiate Championships bigger and better in 2005. The organisers are grateful to all the players that attended the tournament, and for the support of the Nashville Kangaroos and Bearware. Below are some photos from the weekend's matches, including the striking image of Australian football being played in front of a full replica of the Parthenon, the dominant feature of Centennial Park in Nashville, Tennesse.